In a legal opinion released March 2016, the Attorney General confirmed that faith based adoption and child placing agencies are operating within the law, and LB975, which seeks to protect faith-based agencies from adverse actions by the State, does not violate any federal law. Senator Kolterman requested the legal opinion from the Attorney General after accusations and questions were raised not just about the constitutionality of the bill but the actions of faith-based agencies in Nebraska as well. In fact, Senator Morfeld, who voted against LB 975 in Judiciary Committee, filed an official complaint with the Nebraska Department of Health and Human Services on February 22nd, claiming that faith-based agencies were breaking federal law by discriminating on the basis of religion, and therefore LB975 would violate federal codes and cause the state to lose federal funding. “The formal opinion provided today by Attorney General Doug Peterson confirms the solid legal and constitutional foundation of LB975, the bill I introduced to secure safe and loving foster and adoptive homes for the state’s most vulnerable children. The Child Placement Services Preservation Act, as amended by AM2308, ensures that the State of Nebraska will continue to utilize a diverse array of child-placing agencies by protecting the religious liberties of agencies guided to serve by their faith. Not only were these claims against the bill baseless and wrong, they demonstrated the real threat these faith-based agencies face, and why this legislation is needed to allow faith-based agencies to continue to operate according to their faith. The Attorney General’s opinion laid to rest all of the concerns about the bill and further solidified that it is in full compliance with federal law. The opinion confirms that child placing agencies are not state actors. This means they have the ability to operate differently from other state agencies who receive federal funding. The opinion also contended that foster children (who are never denied service) are the beneficiaries of child placing services, rather than adults applying to be foster parents. This an important distinction. 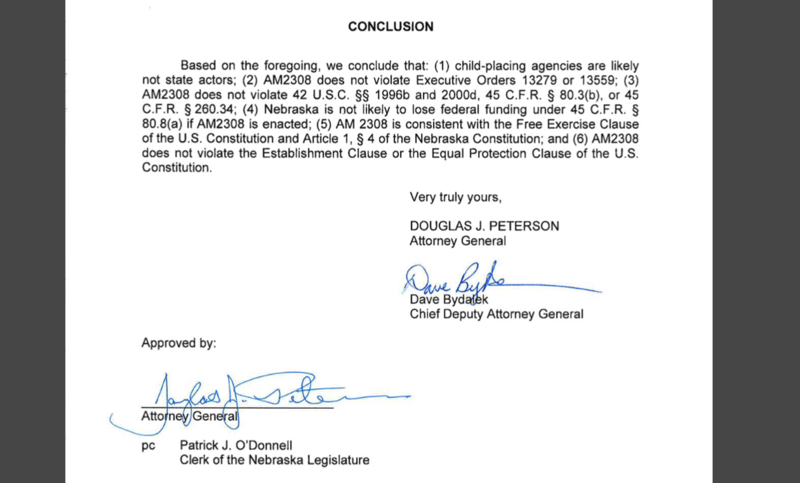 Armed with a legal opinion from the Attorney General confirming our position, NFA is continuing to work to ensure religious liberty is affirmed, and that faith-based child placing agencies in Nebraska can continue to operate as they have for decades. Read the Attorney General’s full opinion here.